What’s better than this, guys being friends. Rex Orange County and Randy Newman have teamed up for a new version of Newman's classic Pixar anthem "You've Got a Friend in Me." 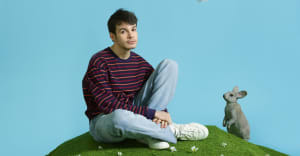 The song was originally written for Toy Story, which came out three years before Rex Orange County was born. "I was lucky enough to get approval from Randy and on top of that, he agreed to join me on the cover of the song," Rex wrote in a note shared on Twitter, calling Newman "legendary." "Piano played by me, vocals by me AND Randy himself Thanks to everyone that allowed this to happen." Rex Orange County is currently on tour; Newman's latest album Dark Matter came out in 2017. Listen to "You've Got a Friend in Me" below. Thumbnail courtesy of Nina Manandhar.